Georgia has stepped up pressure on Russia to hand over a military officer accused of spying, after arresting five others on the same charges. A cordon is again being enforced around the Russian army HQ in the capital Tbilisi, with police ringing the building to prevent anyone leaving. Moscow has demanded the immediate release of its detained officers. Russian Foreign Minister Sergey Lavrov described the actions as subversive and said they should be taken up by the UN. "It is another manifestation of anti-Russian policy," he said, quoted by Itar-Tass news agency. In another development, the Russian embassy in Tbilisi on Thursday stopped receiving documents for issuing visas to Georgian nationals. Wednesday's arrests come as the already tense relations between Georgia and Russia have deteriorated over the past week, the BBC's Matthew Collin in Tbilisi says. Georgia has accused Russia of actively trying undermine its government by backing separatists in the breakaway regions of Abkhazia and South Ossetia, our correspondent says. Georgia also says Moscow is waging economic war against the country through embargoes on imports of Georgian products. Russia has denied the allegations. Georgian Interior Minister Vano Merabishvili said four military officers were arrested along with an NCO and at least 10 Georgians, for planning "a major provocation". The arrests were made in Tbilisi and Batumi. Georgian forces also surrounded the Russian army headquarters in the capital, although reports said the cordon was temporarily lifted overnight. Our correspondent says the police seem unlikely to stand down. Mr Merabishvili said the detained Russians and Georgian citizens had been collecting information on Georgia's relations with Nato, as well on its sea port and railway infrastructure, opposition parties and army. "We neutralised a very serious and dangerous group," he said. 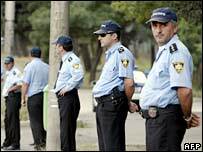 Georgia says the five officers are linked to an attack in the town of Gori which killed three police officers and injured dozens of people. The arrests coincided with the first official visit by pro-Western Georgian President Mikhail Saakashvili to a disputed area on the border between Georgia and the breakaway region of Abkhazia. Russia said his visit was dangerous and would raise tensions between Russia and Georgia. Relations between Moscow and Tbilisi have become increasingly tense since Mr Saakashvili came to power in 2004, pledging to take the Caucasus nation out of Russia's orbit and join Nato and the EU.